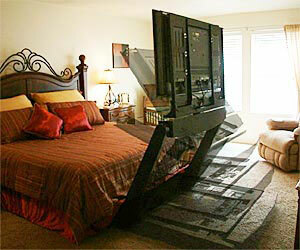 "The Underbed Lift, from MK1 Studios has been around for a few years. But in light of recent plasma screen hiding systems, we figured we�d bring you info about yet another alternative. Now, we�re not sure why you�d want to be stashing your brand new 50 inch plasma anywhere, but if, say, the wife really doesn�t want it on her walls, then maybe she won�t object to having it stored under her bead. Yeah, so when you want to watch the game, late at night, from the comfort of your bed, you need only to press a button, and the Underbed Lift mechanically pulls the screen out from under the bed, and raises it up to optimal viewing height." Not cheap. But I guess if you are in the market for this price is probably not an issue.